While millennials in the workplace have dominated our thinking about generations for years, we are learning more every day about their successors: Generation Z. Now is officially the time to get serious about Gen Z (the generation born approximately 1998 and later), especially if you hire interns or entry-level employees. The good news is that employers, especially Gen X managers, are likely to be impressed with this new group. So far, Gen Zs appear to be entrepreneurial realists who are going to raise our diversity awareness even more. If you are hoping to hire entry-level workers or interns, here are some recent findings about Gen Zs to keep in mind. “Generation Z is the first group of true digital natives; they have never known a world without constant connectivity. However, what they truly desire is face-to-face conversations. In fact, one study shows that 51 percent of Gen Zers say they privilege in-person communication over text messages or emails. Having smartphones in hand 24/7 has taught them the value of a human connection and having a real conversation.” — Huffington Post. “For the last several years, Havas Chicago has drafted its interns through social media, asking them to do everything from rebranding Tuesdays, to taking the job of a Havas executive and promoting a good cause. Its Winternship program is currently underway, and is called “Cold Blooded.” The agency used Instagram Stories to task candidates across the country with one thing: sell Chicago’s harsh winters. Candidates had six days to decide how they wanted to sell the worst time of year in Chicago and two days to post their Stories, and the application process was also promoted through Havas Chicago’s own social media platforms.” — Digiday.com. 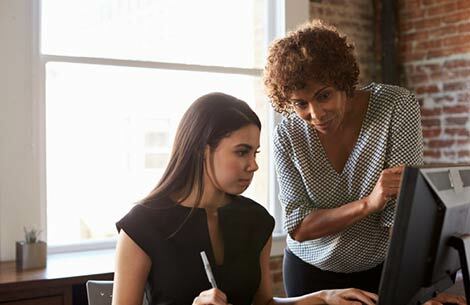 “When it comes to managing … Gen Z, [Nicholas] Wyman, [CEO of the Institute for Workplace Skills and Innovation], advised HR to ‘think mentoring, not management.’ Mentoring is a tool for transferring organizational knowledge while supporting, guiding, and teaching, according to Wyman. It will assist workers to meet the challenges they find on the job, and to identify career growth opportunities. Wyman recommended HR consider developing a system based ‘on and off the job, where a person can earn while they learn.’” — Bloomberg. “For Generation Z, safety means they are looking for stability and that opportunities to advance within a company are based on performance. They want to know what the rules are, and that they are fair. They’re okay with taking risks to stretch and grow. Is it safe to take risks at your company? They need an environment where they can be independent, competitive and even territorial.” — Forbes.com. “Free snacks and ping-pong tables may be nice, but it’s not what Gen Z is after, the survey found. The top three ‘must haves’ for their first jobs are health insurance, a competitive salary and a boss they respect. ‘A common theme we saw in the report is Gen Z’s emphasis on some of the more ‘traditional’ benefits like health insurance and a quality, two-way relationship with their potential manager,’ said Seth Matheson, the director of Monster’s team of in-house recruiters.” — CNBC.com.